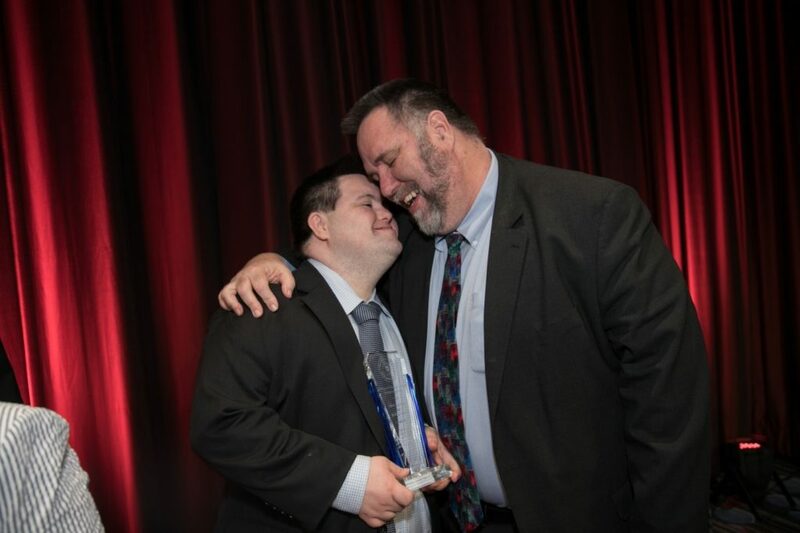 HeartShare hosted its Annual Spring Gala at the New York Marriott Marquis on Wednesday, April 11, which supports children and adults with intellectual and developmental disabilities (I/DD). The “Celebrating Abilities, Building Futures” theme focused on taking the ‘dis’ out of disability. Program participants and honorees alike shared their stories about their strengths and achievements rather than limitations. Ila Eckhoff, Managing Director at BlackRock, has over 30 years of experience in financial services. As a child, her parents encouraged her to work hard and with their support, Ila was able to exceed the expectations of those around her. “Growing up with cerebral palsy, there weren’t a lot of visible role models for me to follow. Thankfully the environment I grew up in is changing every day,” said Eckhoff, mentioning that roughly 20 percent of the global population has a visible or invisible disability. (left to right) Paul Torre (President, Governance, Proxy & Ownership Services, American Stock Transfer and HeartShare Chairman of the Board), Arleen Baez (Managing Director and Chief Operating Officer of Alpine Woods Capital Investors, and HeartShare Board Member), Ila Eckhoff (Managing Director, BlackRock and Cerebral Palsy Foundation Board Member), and Bill Guarinello, President and CEO of HeartShare. John Lee Cronin and Mark X. Cronin, Co-Founders of John’s Crazy Socks, brought a playful spin to the abilities theme. The father-son team produces creative sock designs for holidays and awareness days, but also exemplifies inclusive hiring. John, who has Down Syndrome, is involved in the daily operation of the company, and helps train new employees, almost half of which have differing abilities. “Down’s Syndrome has never held me back,” declared John Cronin. and $1.7M in revenue, which we plan to double this year,” shared father Mark Cronin. “It’s not just enough to sell things anymore. We have a social mission and an e-commerce mission. I want you to take this model. Anybody can do it,” he said to guests. Mark and John Cronin of John’s Crazy Socks were honored with HeartShare’s Msgr. Thomas G. Hagerty Humanitarian Award at HeartShare’s Gala, an award presented to those with a record of philanthropy and demonstrated concern for at-risk populations. John’s Crazy Socks is a father-son venture inspired by Co-Founder John Lee Cronin, a 21-year-old man with Down syndrome, and committed to hiring people with disabilities. Their viral videos have been picked up by BBC News, ABC, Newsday and others, and are fierce advocates for people with disabilities in New York and D.C. 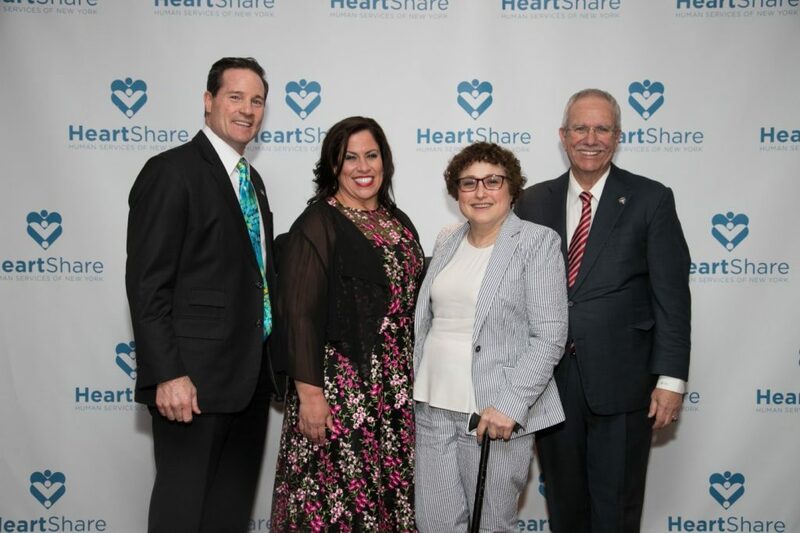 The Cronins came directly from Capitol Hill to HeartShare’s Spring Gala on Wednesday, April 11. CBS Blue Bloods actors Abigail Hawk (“Det. Abigail Baker”) and Robert Clohessy (“Sid Gormley”) with fan and honoree John Cronin of John’s Crazy Socks at the HeartShare Spring Gala on Wednesday, April 11, 2018. Abigail Hawk has been an avid supporter of HeartShare and was a Spring Gala honoree in 2016. Honoree Arleen Baez, Managing Director of Alpine Woods Capital and HeartShare Board Member, is a champion of inclusive hiring practices in the workplace. “Businesses should reflect the communities that they serve and the ever-changing landscape of the world around them,” Baez said. 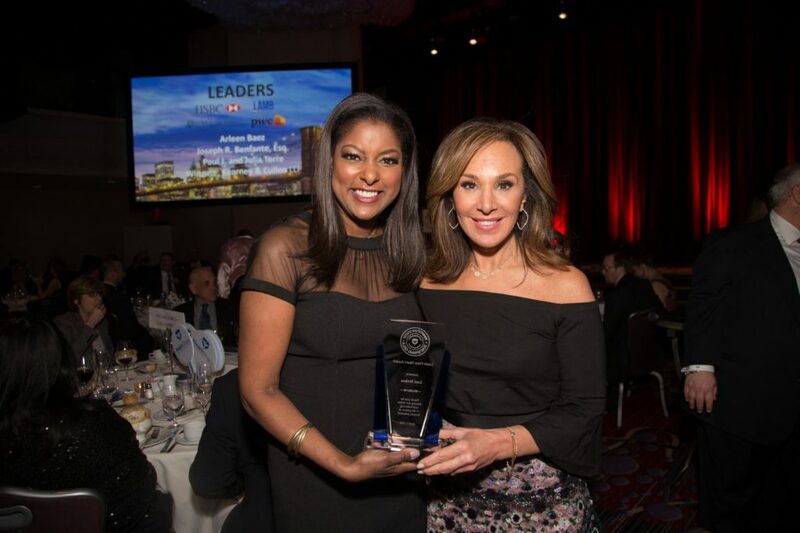 Lori Stokes, Co-Anchor of Good Day New York, was recognized for her service to the community with The Linda Dano Heart Award. Stokes praised the level of independence that HeartShare offers to those in its care. “They can hold their heads up high—they can have control over their lives and the confidence that comes with that,” Stokes said. Rosanna Scotto, HeartShare Board Member, presented The Linda Dano Heart Award to her Good Day New York Co-Host Lori Stokes at the HeartShare Spring Gala on Wednesday, April 11. Lori was recognized for her civic service, which has been central to her upbringing. Her father Louis Stokes was the first black congressman elected in Ohio and her uncle Carl B. Stokes was the first black elected mayor of a major U.S. city. 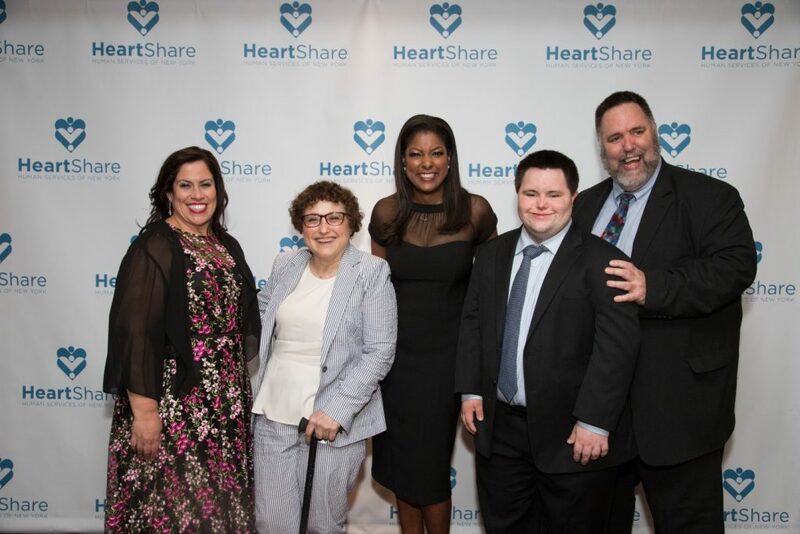 Good Day New York Co-Host Lori Stokes (second from right) received The Linda Dano Heart Award at HeartShare’s Spring Gala. The Fox 5 NY team (left to right) Mike Woods (Weekend Meterologist and Good Day New York feature reporter), Ines Rosales (Traffic Reporter) and Rosanna Scotto (Co-Host Good Day New York) came out to support. Scotto has been a HeartShare Board Member for over 10 years. President Bill Guarinello also recognized stars among its program participants, including HeartShare participant and disability advocate, Gilbert Plaza. Living with cerebral palsy, Gilbert was told that he would never live past the age of 50. From Albany lobbying days to the steps of City Hall, Gilbert raises his voice for the New York disability community. Prior to the live auction, guests heard from parents Elizabeth and Mitch Delano, celebrating their daughter’s ability to live on her own. Elizabeth first turned to HeartShare for her daughter’s Down Syndrome diagnosis. Her daughter Ann Mary not only attended HeartShare’s First Step Pre-School, but returned to HeartShare as an adult and now lives in a HeartShare group home in Jamaica, Queens with one of her closest friends, Ali, who followed a similar track. The live auction aimed to raise money for outings and excursions. “Many times, our trips are the only time our program participants have ventured beyond New York City,” explained Executive Director Linda Tempel, Executive Director of Developmental Disabilities. The live auction also included a large bottle of Veuve Clicquot, a 7-day getaway to Antigua, and a chance to design a custom made sock with John and Mark. The silent auction included options for sports fans, culture enthusiasts, and jetsetters. At its Spring Gala, HeartShare Human Services honored (left to right) Board Member Arleen Baez (Managing Director and Chief Operating Officer of Alpine Woods Capital), Ila Eckhoff (Managing Director, BlackRock and Cerebral Palsy Foundation Board Member), Good Day New York Co-Host Lori Stokes, and John Lee Cronin and Mark Cronin (Co-Founders of John’s Crazy Socks). To learn more about our Developmental Disabilities Services, visit www.heartshare.org.